British Chancellor Gordon Brown has written a book titled, Courage of Heroes, and one of the heroes he describes is Eric Liddell. How did you become interested in Eric Liddell's story? Leilani Wells of the Christian Performing Artists Fellowship, hosts of the MasterWorks Festival, is writing an article about my work. She asked a followup question which I thought I would post: "How did you become interested in Eric Liddell's story?" 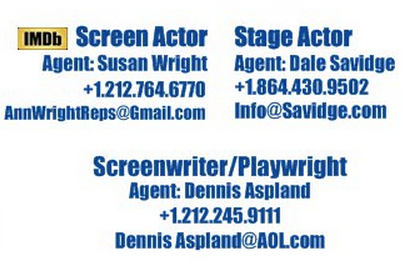 Eric Liddell's story was actually the first one that I wanted to do as a one-man play. I was a runner as a young man and was profoundly inspired by Chariots of Fire on several levels: The running is obvious, though I was a distance man (1500m, 3k, 5k for cross-country, and in college the steeplechase). I was also inspired as a believer. I read one of the biographies on Liddell when I was in high school, and rereading them it was amazing to discover some of the principles upon which I've based my life washing over me afresh. My grandparents were missionaries to Kenya, so I grew up wanting to be a missionary. Finally, I ran a race in China when I was in high school. Okay, here's another: Liddell's leap aboard the ferry after it left the dock was one of the images that kept driving me back to the idea of doing a play about him. Now that scene has been edited out, except for a reference to it, but it sure will be grand on the big screen some day. So why didn't I start with Liddell? I went for the sure thing: the story of John Woolman. He's not exactly a household name, but he is to Quakers and that's where all my contacts were when I first got started, and I'm still performing A Clear Leading from time to time. Several other projects were assigned to me or pressed their way to the front of the line (ie Five Bells for 9/11 and a Christmas play, Views of the Manger). So in 2000, Joyce and I were on our 4th Honeymoon in Edinburgh. They aren't always as exotic as Edinburgh, but that year we were able to tack it onto a business trip that she took and a 16 city tour of England that I had just finished. There we visited the Eric Liddell Centre, but it was closed. It is on what is known as Holy Corner. There is a church on every corner, and the Eric Liddell Centre is built in one of them. We decided to attend one of the existing three churches the next morning and "just happened" to attend the one where Eric Liddell taught Sunday school while he was attending the University of Edinburgh. There we met his niece, Dr. Peggy Judge. She spent much of the next day with us at the centre named after her uncle. We sorted through out of print books, pictures, memorabilia, etc. Unfortunately I returned to a busy schedule and other pressing projects and didn't start work on the play (except for copious notes) until four years later. The next stage of the story is told on my blog, posted April 16, 2006. The whole time line is posted May 9, 2006. I just finished a run of three performances as the first show in the first subscription service for Morningstar Productions in Milwaukee. 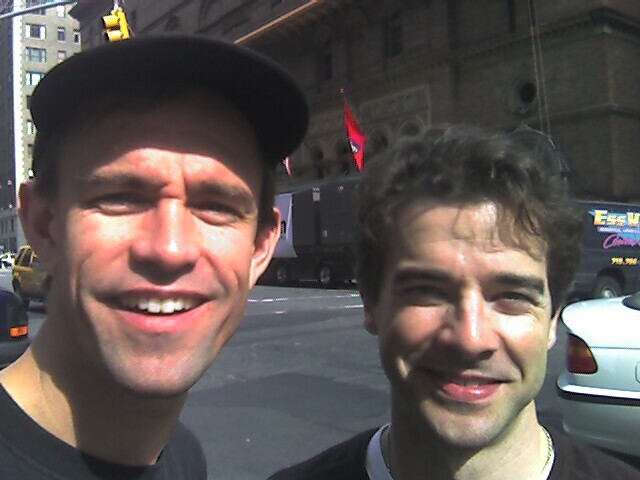 Alan Atwood, who tours with his own 1-man shows, is the artistic director of the company. One of the highlights for me was receiving copies of a couple of letters a women in the congregation received from Eric Liddell's sister, Jenny. Joyce received enough response on the survey below. Thanks to those who helped. Joyce resigned from Business Week Magazine and is working full-time on a masters in counseling. Appreciate your prayers as my one-man plays are now our sole source of income. She's taking a class on statistics right now and she has been given an assignment of surveying iPod users. If you have one and a few seconds please fill out the form below and hit "Submit." How long have you had your iPod? How many songs are there on it? One of the characters in my play Five Bells for 9/11 was recently featured in an article on the front page of the Metro Section in the New York Times: Brief Journey for an Icon of the Attack on New York. Father Brian Jordan is one of three characters the play follows. The priest makes his way on foot down to Ground Zero. 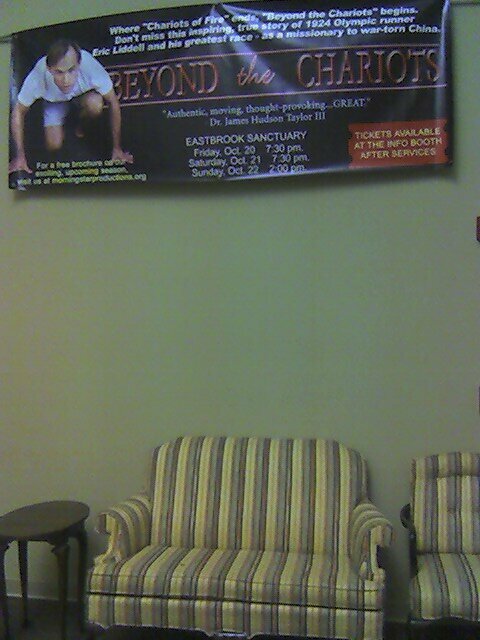 While he's there, the play tells that Frank Silecchia shows him "God's House." 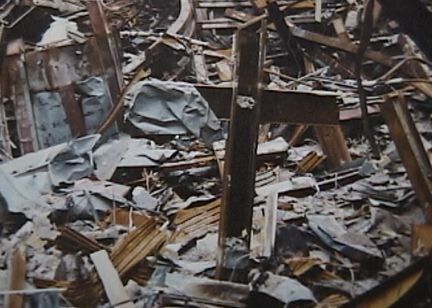 Frank leads him through the rubble to what has become known as the Healing Cross of Ground Zero. Father Jordan had a friend in the mayor's office who kept the cross from being analyzed with all the other scrap. According to the article Father Jordan and Silecchia were responsible for saving the cross again: "... if not for some arm-twisting and noisemaking on the part of the Rev. Brian Jordan, an enterprising Franciscan friar, and Frank Silecchia, the Local 731 laborer who first unearthed the cross, it would be on its way, like many of the other artifacts from the site, to cold storage in Hangar 17 at Kennedy International Airport, courtesy of the Port Authority of New York and New Jersey." Joyce and I got to see a 25-minute preview of One Night with the King on Times Square last month. 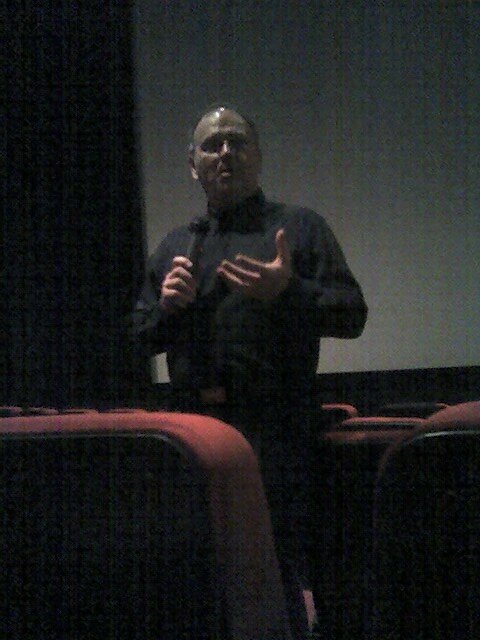 Tommy Tenney, pictured here, wrote the book Hadassah: One Night with the King upon which the screenplay is based. Ultimately it's based on the book of Esther. Peter O'Tool and Omar Sharif give great cameos, and John Noble (Denethor in Return of the King) plays one of the conspirators stopped by Mordechi, played masterfully by John Rhys-Davies (Gimli and Treebeard in The Lord of the Rings). But the real treat is newcomer Tiffany DuPont who brings buoyancy to the role of Esther that is just delightful. Filmed in northern India, Matt Crouch, one of the producers, said they had free reign of a palace, so nothing is a set piece, and the cinematography is breathtaking. For these reasons, and because the level of quality used to tell this story was so high, I was weeping or on the verge of it much of the time. It opens in theatres around the nation on October 13. Mark your calendars now, and send the strongest vote for this kind of film in the future by purchasing tickets in advance for opening weekend. The film is rated PG, for violence, some sensuality and thematic elements. 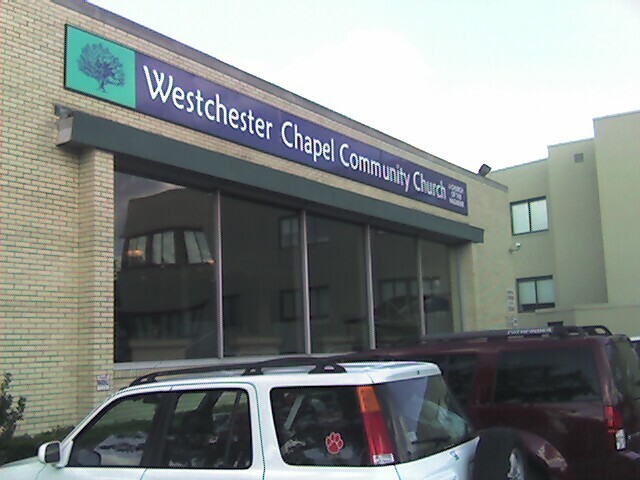 If you're in Westchester County and would like to join our church this Friday night click here. 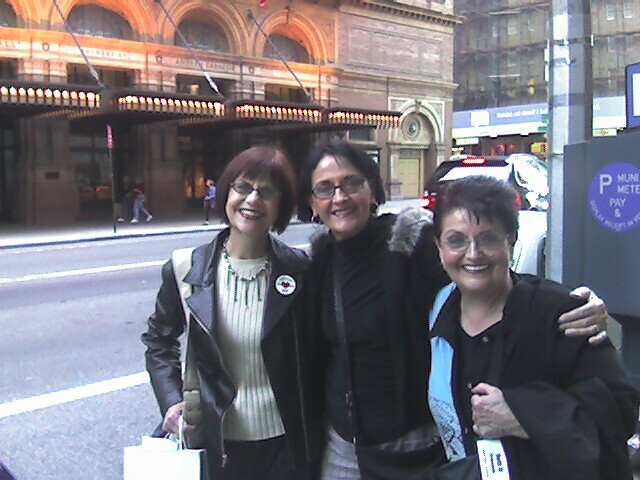 My mom's cousins (left to right) Bev, Bonnie, and Ruth are visiting NYC on the fifth anniversary of the Oregon loves New York trip, just a month after 9/11/01. 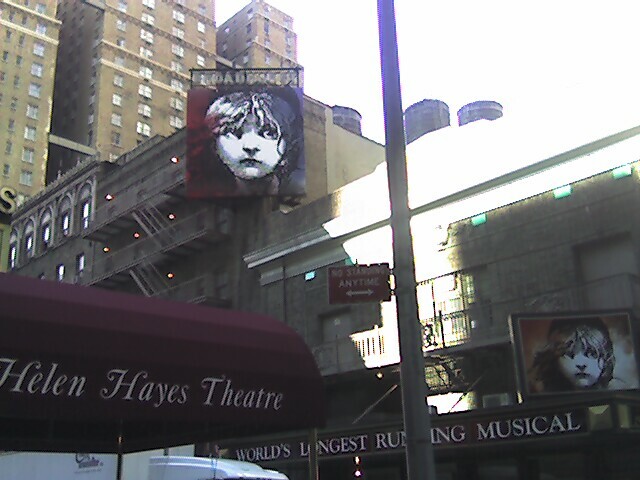 Ruth was on that trip and fell in love with the city, even during its season of mourning. So she brought her sisters along on this trip. Bev stayed with my grandparents while she was in college, so she had stories about them I'd never heard. What a delight. He's performed last night for Carnegie Hall's first televised performance of the season. It will be aired on the 11th. Alan is on the MasterWorks faculty, and it's his heart to reach people's souls. Join me in lifting him up in that endeavor. Sweet! It's right across the street!